When men lose their hair, they know that they aren’t alone. They also know that there are treatments being marketed to them directly during sports games and on late-night television. For women, hair loss can be a lonely experience. Many will often suffer through it without saying anything to family or friends out of embarrassment, trying to hide their thinning hair or balding patches with hairstyle changes, hats, or scarves. However, studies show that the sooner women seek help, the easier it will be to find a treatment that will work. If you want to stop hair loss in New Bedford and are seeking viable hair solutions for women, come to South Coast Hair Options for help. It is important for women to understand that they are not alone. Studies report that as many as five percent of women under the age of 30 have experienced some degree of hair loss unrelated to other medical conditions and treatments. However, the figure goes up sharply between ages 30 and 70, with more than 60 percent of women being affected by hair loss. 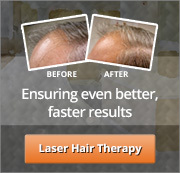 It is important to find solutions in New Bedford to regrow hair in women. Low-level laser light therapy (LLLT), Virtuesse hair replacement, and our own Corrective Hair Solutions (CHS), are just some of the options that women can use to their advantage. However, it is important to understand that there is one-size-fits-all solution when it comes to learning how to stop hair loss in New Bedford. Each client requires a unique treatment formula that is designed specifically for their needs. A woman with female-pattern hair loss would require a different type of treatment than a woman who has a receding hairline. This is why over-the-counter (OTC) solutions from the local drugstore won’t help. While some women have seen a difference with consumer shampoos, most require a professional treatment through a clinic that will treat the true underlying cause of hair loss. When you come to our clinic, you will immediately see something new in our approach to hair solutions for women. Your appointment begins with a FREE scalp evaluation and a professional consultation with one of our highly trained, skilled, and experienced technicians. We work with you to find a way to stop hair loss that is based on the cause of your thinning hair, your rate of hair loss, your lifestyle, and your budget. We can provide you with gradual or instant solutions, as well as long-term options designed to actually regrow hair, depending on your diagnosis. While the most common cause of hair loss in women is female-pattern hair loss or FPHL, there are other causes that might need to be addressed differently. FPHL is an inherited condition, which can come from either the mother or the father. Known by the medical diagnosis of androgenetic alopecia, this type of hair loss can begin in the late teens or early twenties. The earlier it starts, the more the severe the hair loss will usually be, unless you learn how to stop hair loss in New Bedford and find the solution that is right for you. When it comes to hair loss, women need to know what to watch for so they can get help as soon as possible. We all lose strands of hair each day; it’s part of the normal growth and loss pattern. However, if you suddenly start seeing more hair in your brush or on your pillow each day than usual, you might have a problem with thinning hair. Unlike men who get the telltale receding hairline of male pattern baldness (MPB), women will typically see visible thinning over the crown area. The hairs become miniaturized due to a shortened growth cycle, which causes the hair to stay on the head for a shorter period than usual. These miniaturized hairs do not achieve their usual length and are much shorter than the rest of your hair. Typically the first signs that a woman will see is that her natural part, or the part used in her typical hairstyle, is wider than usual or that her ponytail feels smaller. If you find yourself combing your hair over, trying to move your part so your hair will appear fuller, or having to wrap your ponytail band over an extra time, you might be experiencing thinning hair. If you have noticed any of the signs mentioned above, give us a call at South Coast Hair Options by dialing 508-995-7085. Our goal is to stop hair loss in New Bedford and find viable hair solutions for women that will help them to feel like themselves again.